This was supposed to be the trip where Smyly was skipped in the rotation again. Instead, he's called to start with Anibal Sanchez on the disabled list. He tossed six innings of two-run ball on April 23 against the White Sox. Duffy was the probable choice after Bruce Chen was scratched because of back problems. Duffy had four scoreless outings in his first experience with relief pitching, but he faced five batters and didn't get an out in in his last two bullpen outings. One half of Saturday's Tigers-Royals pitching matchup made the Opening Day rotation alongside Justin Verlander, Max Scherzer and Anibal Sanchez, yet made just two starts in April thanks to rainouts and off-days. Drew Smyly actually spent more time in the Tigers' bullpen, even though his relief days were supposedly over. "Just a Major League pitching rover," Smyly said. The other half of the matchup lost out on the Royals' fifth starter competition, made it back to Kansas City in the bullpen, and now starts in place of injured Bruce Chen. For Danny Duffy, the spot assignment is a reminder of his standing as one of the club's starting prospects not that long ago. It's not a marquee matchup of lefties at Kauffman Stadium, but it's an interesting one. For Smyly, the days of bouncing between the rotation and bullpen should be over for a while. After playing just 23 games over the first month of the season, lowest in the Majors, the Tigers began a stretch Friday of 50 games in 52 days. 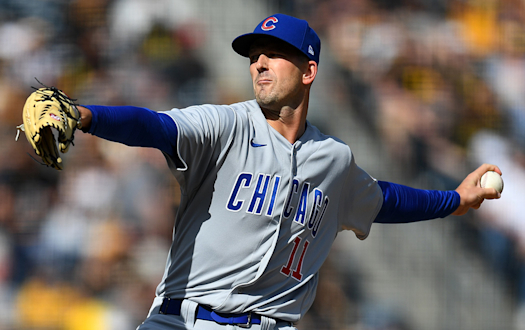 They could still use their next off-day on May 15 to skip Smyly if they want to keep his innings down, but it wouldn't be a long break. "I'd better be ready," Smyly said. "I'm in trouble if I'm not. Yeah, I'm excited to get back on a routine. It kind of stinks sitting around for 10 days. You feel like you lose your sharpness because you lose the game action, but there's nothing you can do about it. Just gotta be ready." Duffy lost the fifth rotation spot to Yordano Ventura in Spring Training and, after some debate, was sent off to Triple-A Omaha to continue starting rather than toil in relief. But that changed abruptly and, after one start, Duffy was recalled to KC to shore up the bullpen. That went well for a time -- no runs in four outings -- and then turned sour -- five batters faced in two games without getting an out. An intense pitcher, Duffy will try to keep calm and in command of his emotions as well as his pitches against the Tigers. "Those things are hard to change, that's who he is," manager Ned Yost said. "You can tell yourself to calm down and stay within yourself, but it's hard to do. But, he'll get better at it as time goes on. As he gets more confident in his abilities, he'll get better at it." Yost noted that staff leader James Shields is able to harness his often visible emotion and use it to his advantage, something not many pitchers can do. "Duffy is just going to have to work his way through it. ... It takes years and years before you can get to the point where you master it," the skipper said. Yost expects Duffy could throw between 75 and 85 pitches before needing help. "I think he's going to give us a good five innings and we'll go from there," he said. Miguel Cabrera is still looking for the power swing that helped him win back-to-back American League Most Valuable Player Awards, but his sweet swing for average seems to be coming around just in time for his return to Kansas City. Cabrera is batting 14-for-35 (.400) over an eight-game hitting streak with three doubles, nine RBIs and six runs scored. His RBI double off Shields in Friday's series opener was the 14th of his career at Kauffman Stadium, his highest total of any ballpark he hasn't called home. Cabrera enters Saturday batting just .227 (5-for-22) against left-handers this year with a double, a home run and four RBIs. Meanwhile, he needs two hits to tie Pete Fox for 21st on the Tigers' all-time list with 1,182. After a dreadful start, designated hitter Billy Butler's bat is producing. "He's getting back, he's getting close," Yost said. "He's starting to drive the ball in the air. He's getting it off the ground, he's starting to do what he does best -- drive the ball [toward right], drive the ball in the left-center-field gap. And when they get a pitch up, drive it into left field. He's getting much better." Butler, at .143 after the first 12 games, has his average up to .236 as he went 1-for-4 in Friday's 8-2 loss -- belting his first home run of the season off Rick Porcello. "I'm feeling good at the plate, just putting quality at-bats together," Butler said. "I'm seeing the ball good now. I knew it was going to come. I didn't know when, but I'm feeling good about my pitch selections and getting some good results, and obviously that's given me some confidence." Butler noted that he's always hit well at Kauffman Stadium. For his career, his average is .317 at home versus .276 on the road. The difference is really striking this year -- away, he's just .153 (9-for-59) compared to .340 (16-for-47) at Kauffman. "We play 81 games here and I'm definitely comfortable in our box, and that's a good thing to be," he said. • The Royals' three 2013 Gold Glove Award winners -- left fielder Alex Gordon, catcher Salvador Perez and first baseman Eric Hosmer -- will receive their trophies before Saturday night's game. The first 10,000 fans will receive commemorative T-shirts. • Look for Rajai Davis and Nick Castellanos to return to the Tigers' lineup on Saturday against the left-hander Duffy. Both had Friday's series opener off following Thursday's scheduled off-day. Bryan Holaday could also get a start. • Joe Nathan's next save will be No. 347, which would match Randy Myers for ninth on the all-time Major League leaderboard. 1. Rajai Davis flies out to center fielder Justin Maxwell. 2. Ian Kinsler lines out to right fielder Nori Aoki. 1. Nori Aoki strikes out swinging. 2. Omar Infante grounds out, pitcher Drew Smyly to shortstop Danny Worth to first baseman Miguel Cabrera. 3. Eric Hosmer grounds out softly, pitcher Drew Smyly to first baseman Miguel Cabrera. 1. Victor Martinez doubles (6) on a line drive to left fielder Alex Gordon. 3. Austin Jackson pops out to first baseman Eric Hosmer in foul territory. 4. Nick Castellanos grounds into a force out, third baseman Danny Valencia to second baseman Omar Infante. Victor Martinez to 3rd. Torii Hunter out at 2nd. Nick Castellanos to 1st. 5. Bryan Holaday flies out to right fielder Nori Aoki in foul territory. 1. Billy Butler flies out to center fielder Austin Jackson. 3. Danny Valencia grounds out softly, third baseman Nick Castellanos to first baseman Miguel Cabrera. Alex Gordon to 2nd. 4. Alcides Escobar lines out to right fielder Torii Hunter. 1. Danny Worth grounds out, third baseman Danny Valencia to first baseman Eric Hosmer. 2. Rajai Davis flies out to center fielder Justin Maxwell. 3. Ian Kinsler singles on a ground ball to center fielder Justin Maxwell. 4. With Miguel Cabrera batting, Danny Duffy picks off Ian Kinsler at 1st on throw to Eric Hosmer. 1. Justin Maxwell strikes out swinging. 2. Brett Hayes pops out to first baseman Miguel Cabrera. 3. Nori Aoki pops out to third baseman Nick Castellanos in foul territory. With Victor Martinez batting, wild pitch by Danny Duffy, Miguel Cabrera to 2nd. 2. Danny Duffy intentionally walks Victor Martinez. 3. Torii Hunter strikes out swinging. 4. Austin Jackson walks. Miguel Cabrera to 3rd. Victor Martinez to 2nd. 5. Nick Castellanos out on a sacrifice fly to left fielder Alex Gordon. Miguel Cabrera scores. 6. Bryan Holaday lines out to left fielder Alex Gordon. 1. Omar Infante grounds out, pitcher Drew Smyly to first baseman Miguel Cabrera. 2. Eric Hosmer doubles (11) on a line drive to center fielder Austin Jackson. With Billy Butler batting, wild pitch by Drew Smyly, Eric Hosmer to 3rd. 3. Billy Butler strikes out swinging. 4. Alex Gordon flies out to center fielder Austin Jackson. Pitching Change: Louis Coleman replaces Danny Duffy. 1. Danny Worth pops out to first baseman Eric Hosmer in foul territory. 2. Rajai Davis strikes out swinging. 3. Ian Kinsler doubles (7) on a fly ball to center fielder Justin Maxwell. Ian Kinsler out at 3rd, center fielder Justin Maxwell to second baseman Omar Infante to third baseman Danny Valencia. 1. Danny Valencia singles on a line drive to left fielder Rajai Davis. Danny Valencia out at 2nd, left fielder Rajai Davis to second baseman Ian Kinsler. 2. Alcides Escobar called out on strikes. 3. Justin Maxwell grounds out, shortstop Danny Worth to first baseman Miguel Cabrera. 1. Miguel Cabrera doubles (9) on a fly ball to right fielder Nori Aoki. 2. Louis Coleman intentionally walks Victor Martinez. 3. Torii Hunter flies out to center fielder Justin Maxwell. Miguel Cabrera to 3rd. Victor Martinez to 2nd. Pitching Change: Kelvin Herrera replaces Louis Coleman. 4. Austin Jackson grounds out, third baseman Danny Valencia to first baseman Eric Hosmer. 5. Nick Castellanos doubles (4) on a line drive to right fielder Nori Aoki. Miguel Cabrera scores. Victor Martinez scores. 7. Danny Worth grounds out, second baseman Omar Infante to first baseman Eric Hosmer. 1. Brett Hayes grounds out, shortstop Danny Worth to first baseman Miguel Cabrera. 2. Nori Aoki flies out to left fielder Rajai Davis. 3. Omar Infante pops out to shortstop Danny Worth. Pitching Change: Aaron Crow replaces Kelvin Herrera. 1. Rajai Davis grounds out, second baseman Omar Infante to first baseman Eric Hosmer. 2. Ian Kinsler grounds out, first baseman Eric Hosmer to pitcher Aaron Crow. 3. Miguel Cabrera lines out to first baseman Eric Hosmer. 1. Eric Hosmer grounds out, second baseman Ian Kinsler to first baseman Miguel Cabrera. 3. Alex Gordon strikes out swinging. 4. Danny Valencia strikes out swinging. Pitching Change: Aaron Brooks replaces Aaron Crow. 1. Victor Martinez flies out to right fielder Nori Aoki. 2. Torii Hunter grounds out, third baseman Danny Valencia to first baseman Eric Hosmer. 3. Austin Jackson doubles (7) on a ground ball to left fielder Alex Gordon. 4. Nick Castellanos strikes out swinging. Pitching Change: Joba Chamberlain replaces Drew Smyly. 1. Alcides Escobar grounds out, third baseman Nick Castellanos to first baseman Miguel Cabrera. 2. Justin Maxwell strikes out swinging. 3. Brett Hayes flies out to right fielder Torii Hunter. 1. Bryan Holaday singles on a line drive to center fielder Justin Maxwell. 2. Danny Worth doubles (1) on a fly ball to center fielder Justin Maxwell. Bryan Holaday scores. 3. Rajai Davis singles on a bunt ground ball to third baseman Danny Valencia. Danny Worth to 3rd. With Ian Kinsler batting, Rajai Davis steals (9) 2nd base. 4. Ian Kinsler out on a sacrifice fly to center fielder Justin Maxwell. Danny Worth scores. Rajai Davis to 3rd. 5. Miguel Cabrera singles on a line drive to center fielder Justin Maxwell. Rajai Davis scores. 6. Victor Martinez singles on a ground ball to right fielder Nori Aoki. Miguel Cabrera to 2nd. 7. Torii Hunter homers (4) on a fly ball to left field. Miguel Cabrera scores. Victor Martinez scores. 8. Austin Jackson strikes out swinging. 9. Nick Castellanos grounds out, shortstop Alcides Escobar to first baseman Eric Hosmer. Defensive Substitution: Don Kelly replaces second baseman Ian Kinsler, batting 2nd, playing first base. Defensive Substitution: Andrew Romine replaces first baseman Miguel Cabrera, batting 3rd, playing shortstop. Defensive Substitution: J. Martinez replaces right fielder Torii Hunter, batting 5th, playing right field. Defensive switch from shortstop to second base for Danny Worth. Pitching Change: Phil Coke replaces Joba Chamberlain. 1. Nori Aoki singles on a ground ball to left fielder Rajai Davis. 2. Omar Infante flies out to center fielder Austin Jackson. 3. Eric Hosmer doubles (12) on a line drive to right fielder J. D. Martinez. Nori Aoki to 3rd. 4. Billy Butler out on a sacrifice fly to center fielder Austin Jackson. Nori Aoki scores. 5. Alex Gordon doubles (12) on a fly ball to center fielder Austin Jackson. Eric Hosmer scores. 6. Danny Valencia flies out to left fielder Rajai Davis. IBB: Martinez, V (by Duffy), Martinez, V (by Coleman). Pitches-strikes: Smyly 93-60, Chamberlain 12-9, Coke 21-15, Duffy 75-41, Coleman 20-11, Herrera, K 11-6, Crow 9-5, Brooks 45-30. Groundouts-flyouts: Smyly 7-3, Chamberlain 1-1, Coke 0-2, Duffy 2-3, Coleman 0-1, Herrera, K 2-0, Crow 2-0, Brooks 2-2. Batters faced: Smyly 24, Chamberlain 3, Coke 6, Duffy 17, Coleman 6, Herrera, K 4, Crow 3, Brooks 13. Inherited runners-scored: Herrera, K 2-2. Umpires: HP: Todd Tichenor. 1B: Gabe Morales. 2B: Tim Timmons. 3B: Tim Welke.